In some ways SF comparisons between modern sports and Roman arenas, where blood and guts are spilled in obligatory fashion, might come off as a soft target. Imagine if the football players had knives! Pass. Imagine if one of the players had a gun! Double pass. Yes, we know sports can be violent and taxing on the mind and body. A quick browse through the current NFL injury list and articles such as The Boston Globe‘s six-part series on Aaron Hernandez makes grim and disturbing reading (researched only for this post). And adding levels of violence and trauma to an already splattered playing field is a predictable avenue of SF speculation. Predictable yet relentlessly fascinating in the hands of a talented author…. As I mentioned in my review of William Harrison’s fantastic “Roller Ball Murder” (1973) — “I’m a proponent of sports as a SF vehicle for social commentary on commercialism, trauma, alienation, and violence.” Gary K. Wolfe’s Killerbowl successfully ticks all the boxes while simultaneously providing a driving narrative–the countdown (in non-linear fashion) towards Super Bowl XXI (2011). T. K. Mann is an old man. Let’s back up a bit — Mann, the quarterback of the San Francisco Prospectors, is old by football standards, especially in a future version of the sport involving body armor, bullets, and gameplay across evacuated city blocks (homefield advantage takes on a whole new meaning). 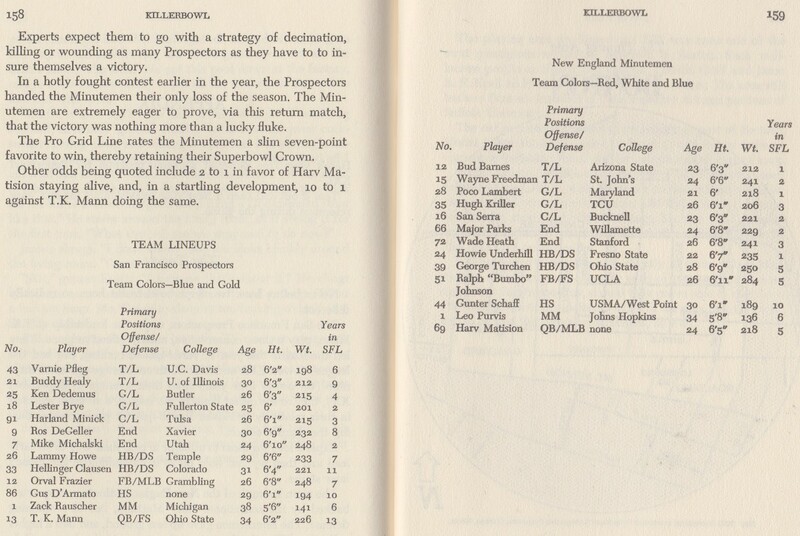 A new breed of quarterback has entered the fray—Harv Matison, of the New England Minutemen. While Mann attempts to limit the casualties accrued on the field, Harv sacrifices his players willy-nilly, and with every uptick in his death stats, his legions of adoring fans multiple…. He embodies the direction football audiences crave–longer games, more guns, more deaths. A showdown is imminent. Mann wants revenge. Harv wants carnage. Three elements of Killerbowl elevate the novel above similar sports-themed SF I’ve enjoyed—1) the narrative 2) the structure 3) the visual and societal details. Joachim Boaz praising narrative? Even I fall victim to an empathetic underdog story if the novel is well-wrought and inventive. The most fascinating part of the novel is Mann’s decision to continue to play the game despite his discovery of Spenser’s tricks. A game within a game…. It takes a few moments before the structure of the novel, a series of flashbacks to moments in time before the Super Bowl, syncs into comprehensible formation. In many ways the reader keys into “sports time,” counting down towards the days and months before “the big game” or identifying a character’s narrative as in dialogue with the “moment” that defines the season and, by extension, the book. This is a brilliant choice. Wolf’s visual touches, maps of the Boston playing field and team lineups, add surprising complexity to the story. Take a minute to examine the two images [click the scan to enlarge]. Notice the characters who did not play college football…. An important point for the “new breed” of player! 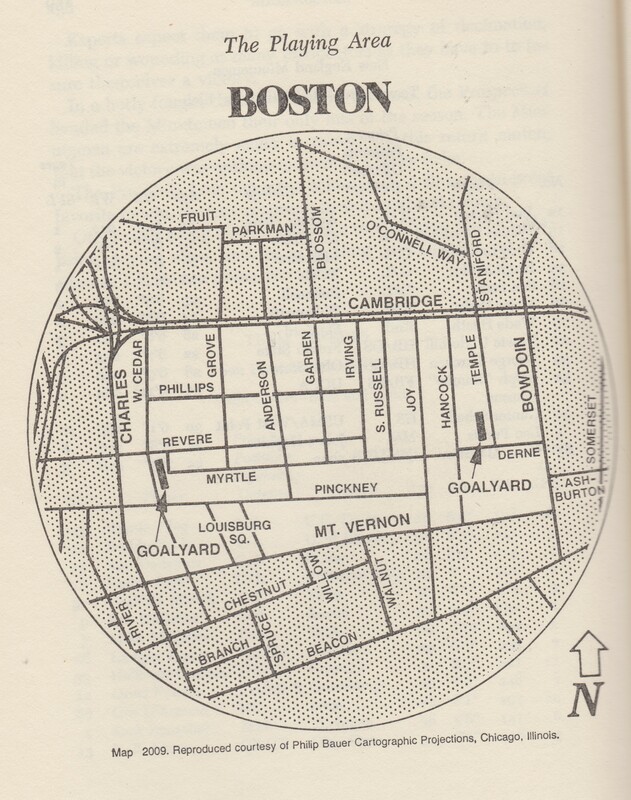 If I’m not mistaken, this is and was an incredibly wealthy area of Boston…. evacuated to play a sport. Other details combine deftly with the narrative structure—for example, quotes from pseudo-scholarly articles (paid for by the IBC), news blurbs, sections from the perspective of the fans, etc. Wolf certainly does not engage in the John Brunner brand of cultural deluge à la Stand on Zanzibar (1968), but intersperses these fragments at opportune moments to add detail and complexity. 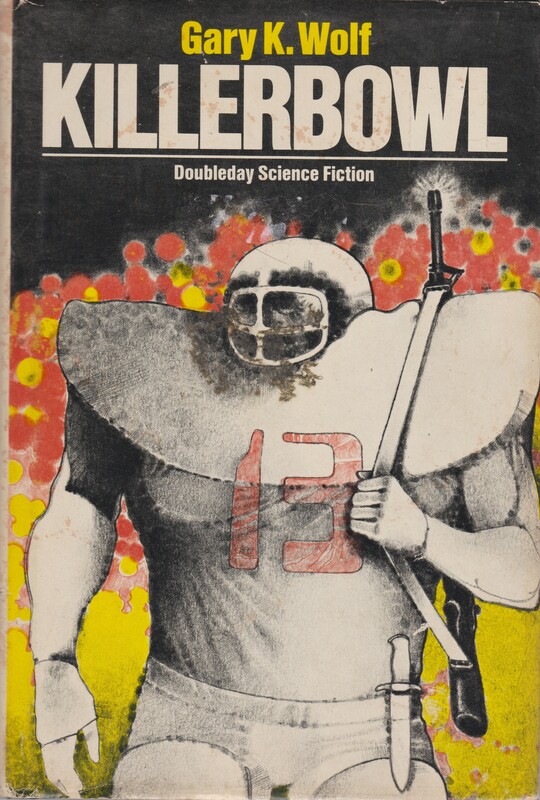 Killerbowl (1975) succeeds as an exemplar of sports SF, and inventive 70s SF more broadly. Wolf manages to be experimental yet readable, direct in prose yet lyrical. New Wave SF distilled into a shot glass, a punch to the gut filled with intensity and mood. Highly recommended. If you’re interested in Wolf’s use of diagrams/charts/maps, check out my relatively recent post on the subject (focusing on Sladek et al.)…. As I recall, at the time the cover seemed awful (it still does to me) and the book appeared on a par with exploitative ‘Skinhead’ novels, etc. that had been a fad here a few years before. Which one? The UK edition? But yes, neither edition has a brilliant cover — and the US edition doesn’t even seem to fit very neatly in the aesthetic that Doubleday was trying to achieve…. The Doubleday cover just seems downright ugly, but that aside, the book could almost be a metaphor for today’s politics. One side playing for the sake of pure blood and carnage while being owned by a predatory weasel who cares about nothing but attention and money (i. e. ratings). It should be noted that Games Workshop/The Black Library did a series of books in the Blood Bowl universe in which the violence was way over-the-top. And no, I haven’t read any. Well, it’s a FAR more complicated book than the cover suggests. Hopefully my review made that clear! Definitely one to look for. Thanks for highlighting it. Read anything fascinating recently Adam? As far as SF goes? Most recently, Butler’s “Parable of the Sower” and Freakangels, vol. 1. I’m a big Wyndham fan, so I was intrigued to hear about that comic series (which adapts the “Cuckoos” basic plot, and sets it further into the future). Butler is my big “I haven’t read any of her work yet” author — I own a few of her books…. Maybe I’ll start with her first novel, Patternmaster (1976) (which she disliked if I’m not mistaken), rather than a “classic” — > time to go track down a copy…. Copies of the 1st edition paperbacks are INCREDIBLY expensive (for a paperback)! Wow. I have a pretty nice first edition of “Dawn” – hardcover. Haven’t looked up what it’s worth. As far as other works, I think I have a few in the Patternmaster series; then there’s the Xenogenesis (or “Lilith’s Brood”) series; there’s your “classic.” But Butler’s darn good at stories, too. Sad that she died so damn young. Do you need to read the Patternmaster series in order? That was my impression – that the books should be read in order; it’s been more than ten years now, so I’ve forgotten, but I seem to recall the first couple of books following in sequence. I don’t think I read more than the first two, however. I’m pretty awful with starting and not completing series. 😦 Unless it’s a trilogy. That Abe book sounds pretty damn cool. A recent acquisition for me was “Pavane” by Keith Roberts. Haven’t read yet, but I’ll try to slot that into the 2019 reading list. I got an Abe book (most recent acquisition post), that sounds even cooler than Inter Ice Age 4 (no pun intended)….. Takes place in a giant underground hospital. I read Pavane a while back but never got around to reviewing it. I enjoyed it!